As someone with an affinity for both wireless devices and mechanical keyboards, I am saddened that wireless mechanical keyboards are few and far between. Only a handful of models exist, and unfortunately none of them quite fit my tastes. For this reason, I decided to go with a DIY approach. I figured since I had already voided the warranty on my Das a while back (with the vinyl wrap), I'd just go all the way and make the thing wireless. This build log can serve as a guide for doing wireless mods in general. The process should be the same for most keyboards. After a bit of research, I decided upon a method that is essentially replacing the internals of the mechanical board with that of a wireless one. The mechanical switches would be wired to replicate the membrane matrix of the wireless board, and connected to the wireless board's controller. This seemed like a straightforward, reliable, and cost efficient approach. Being my first attempt at this, I decided to go for the least expensive board I could find. I ended up choosing a HP K2500 to be the donor keyboard since it had the same (104-key) layout as the Das and minimal amount of additional features. The small USB dongle was also nice. Final shot of the Das before the transformation. Not much to say about the wireless board, everything came apart after removing the screws. 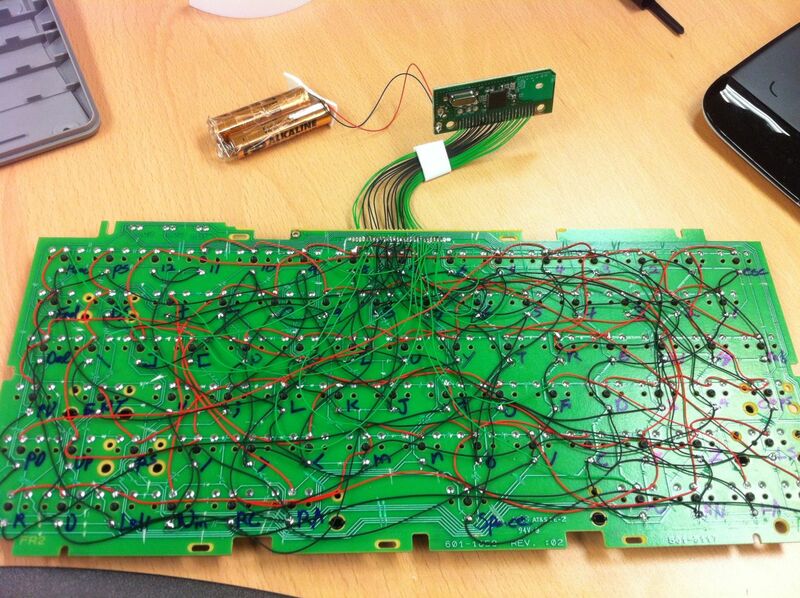 Things get a bit complicated with the Das, since all switches had to be de-soldered in order to separate the PCB. There are other ways to isolate the switches from each other, such as scratching out all the connections, which may be more practical on other keyboards. I opted to remove the whole PCB just to be safe. Doing so would also leave me with a functional keyboard controller and PCB in case I ever need it in the future. At this point with the PCB off, I noticed that the switches were a bit loose with only the backplate holding them, so I went ahead and secured them with some hot glue. In hindsight, I should have done this after the wiring, as then I could have also glued down the wires at the same time and do everything in one pass. Also, the glue would not have gotten in the way as it did occasionally during the wiring. Trace its path on the membrane and make note of all the keys it runs through. Mark the corresponding switches on the mechanical board, and wire them together. The connection paths on the membrane are often unnecessarily long and winding in order for them not to cross each other. The switches do not have to be wired in any particular pattern, as long as they are all connected. Using a different color of wire for each run will make things easier on the eyes. Either way, double and triple-check before and after soldering. 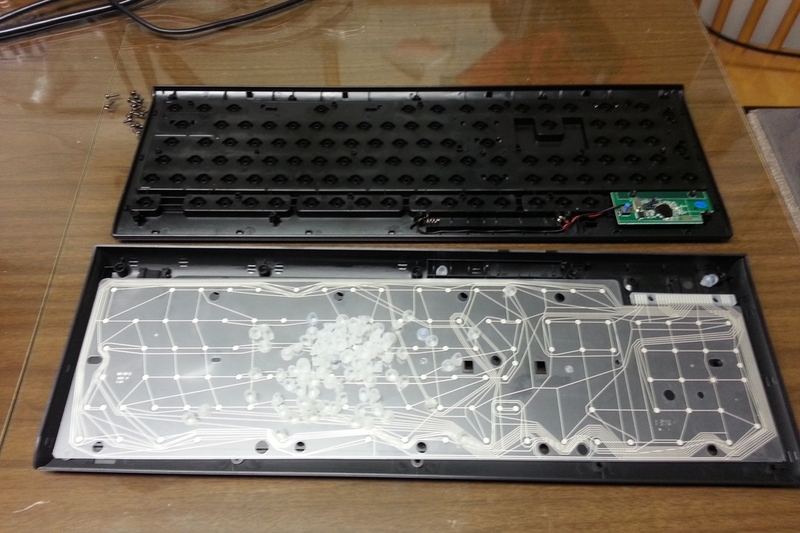 Depending on the keyboard, the space behind the backplate may be tight, it is best to keep the wiring as neat as possible. Thinner wire also helps. Being consistent also goes a long way in keeping the wiring neat. One thing I did was wire all the runs from the top membrane to the thicker pin on each switch (and vice versa). 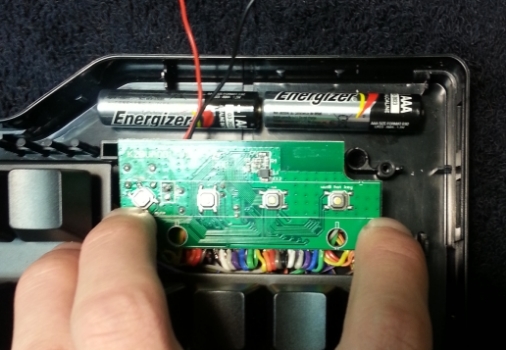 After soldering everything, I hooked up the batteries and did a quick test to see if everything was wired correctly. Once I made sure every key worked as it should, I went ahead with the final assembly. Firstly, I did a quick fit to make sure there was room for everything inside the case and finalize the placement of the internals. As you can see, everything fit nicely (and with ample room to spare thanks to the Das Keyboard's signature "hump"). 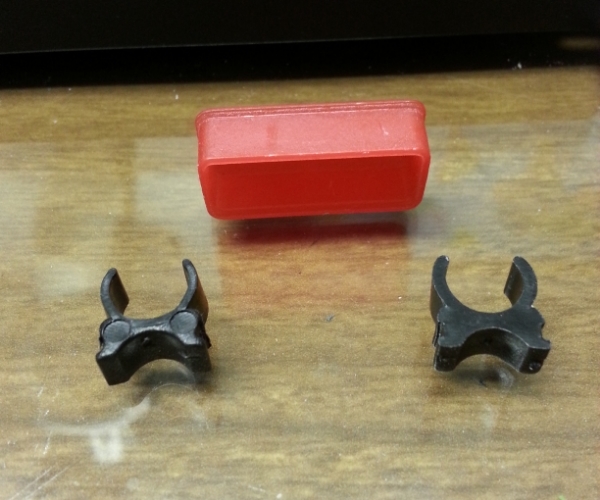 After scavenging around the house, I settled with two plastic clips that held a pen in its packaging and a cap for the end of a DVI cable. 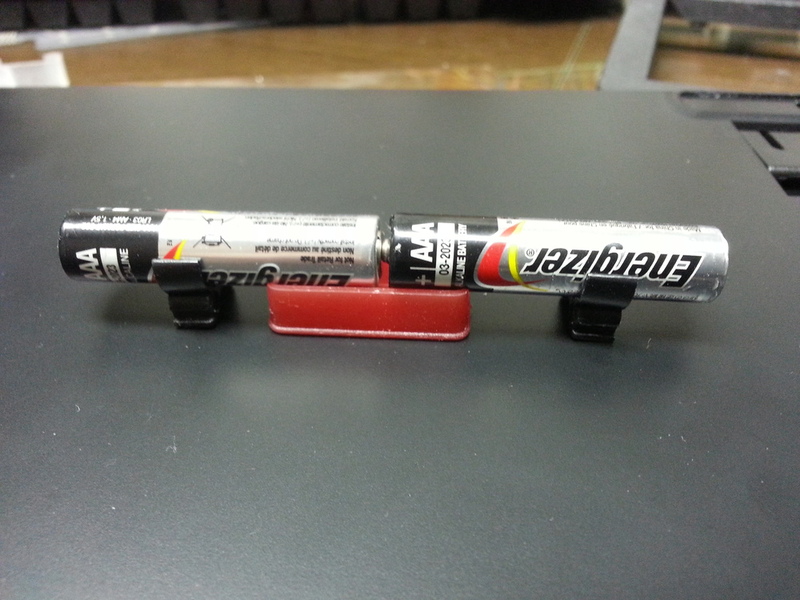 Together, they made a crude but effective battery compartment. ...for when you don't have a battery pack. Next, I took an old graphics card cooler that was lying around and cut out a rectangular chunk of plastic. I glued this to the backplate so that it would press down on the controller and secure it in place. Finally, I wanted to do something to address the empty slots originally used for the USB passthroughs, as well as the hole at the top where the cable once was. Noticing that the plastic from the graphics card cooler was similar enough, I carefully cut out and sanded these pieces to fill the gaps. They actually turned out better than I was expecting since the color and and texture was a near-match. Overall, everything went smoother than I had anticipated. (I think software development has conditioned me to expect roadblocks.) The most challenging aspect of the entire process would be the soldering, since I had limited experience with that. That's it for the build log. I probably could have taken more pictures along the way, but hopefully my explanations are clear enough for most parts. 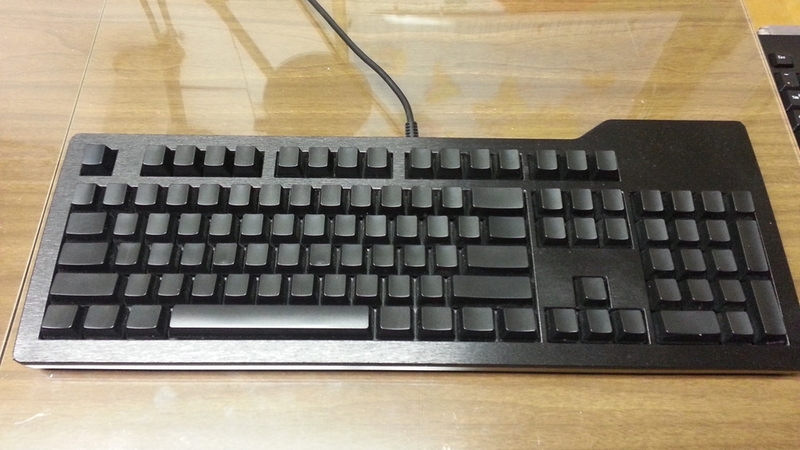 Some additional pics of the keyboard are here.